Now you can have the taste of American fall at any time of year, right here in Europe! 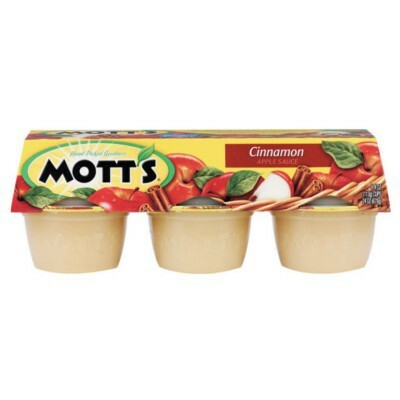 Each of these 6 Mott's Cinnamon Applesauce cups is great for your packed lunch, a quick snack, or a healthy dessert. Packed with sweet, spicy cinnamon flavor, this is a variety of compote you'll be hard-pressed to find elsewhere! Great for adults and for kids! 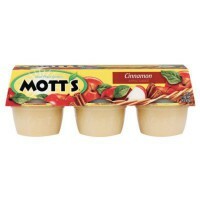 Apples, high fructose corn syrup, water, cinnamon, antioxidant E300 (vitamin C), natural flavor. Contains GMO. Nutrition facts (for 100g): calories 88Kcal, total fat 0g (saturated fat 0g), total carbohydrate 22.1g (sugar 21.2g), protein 0g, salt 0g.